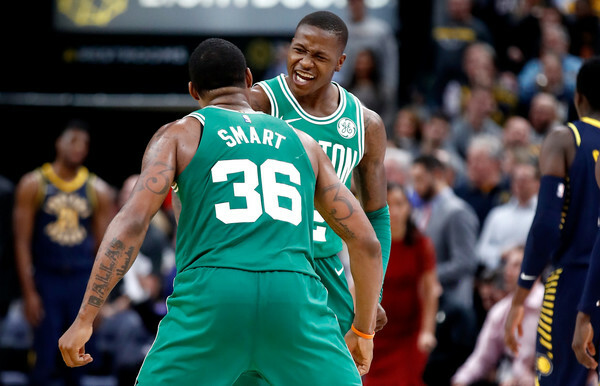 Marcus Smart and Terry Rozier are the key bench guys for the Celtics. For the first half of the NBA season, both have been defensive stalwarts. But their offensive production has not been consistent or efficient. That seems to be changing. For the past five games, Terry is hitting 60.4% of his field goals, 55.6% of his three-pointers and 83.3% of his free throws, much improved over his early-season numbers. For the past three games, Marcus is connecting on 39.5% from the floor. It is a very small sample from three games, but I have previously written that with Smart's other valuable contributions, getting to 40% on field goals is - well - an important goal for him. For the last three games, I love seeing an almost-40% FG stat for Marcus along with 4.0 rebounds, 4.3 assists, 1.7 steals and 1.3 blocks. That tells me that he may be approaching the complete player many envisioned. His shooting may revert to the early-season accuracy, but for now this is hopeful. At mid-season, breakthroughs for both may be in store for the remaining games. That would be terrific heading into the playoffs. Speaking of great timing, T-Ro outscoring LeBron James in only 20 minutes during last nights win against Cleveland could not have been better-timed. Let's all hope the upward trend for these two bench guys continues.